One of the skills I have been learning over the past year and a half or so is memory analysis. For those of you that don't know the Volatility's Google Code page has made quite a few memory samples available for test analysis. I stumbled upon them this evening, and I figured I'd try to tear one apart for an hour or so, and see where that got me. 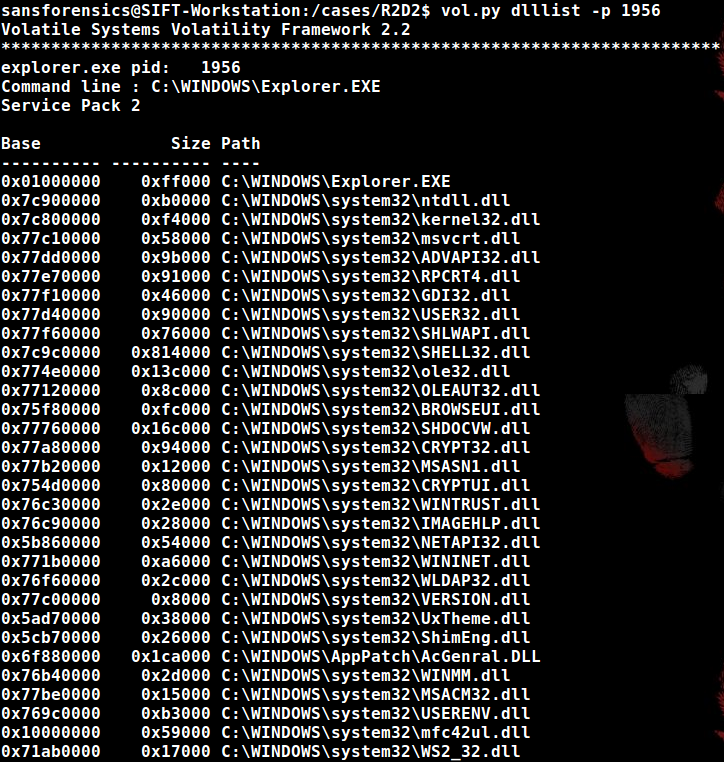 For my analysis I used Volatility 2.2 and SANS' Ubuntu SIFT Workstation VM. This sample appears to have no hidden processes. It is always a good idea to see what network traffic was occurring at the time of the memory capture. The connscan plugin will parse connection information from the image. It appears there was an established connection from the localhost on local port 1026 to 172.16.98.1 on port 6666. This connection was established by PID 1956 or explorer.exe (correlated from pstree output). This connection is suspicious because explorer.exe does not typically make network connections, so this connection lets us know that explorer.exe is probably our process of interest. In the command history buffer were two commands "sc query malwar" and "sc query malware" (Just what we were looking for!). It appears the attacker was checking on the registration details for a service named malware. At this point the service name is a good indicator of malicious activity, but I've seen some pretty strange things in the past. To enumerate that service information we can check the HKLM\SYSTEM\ControlSet001\Services registry key for the "malware" service's registration details. We have to first find the virtual memory address of the System hive, which we can do using the hivelist plugin. Once we have the virtual address (0xe1018388) we can enumerate the key ControlSet001\Services\malware using the printkey plugin. Looking at the malware service we notice the service's image path was C:\WINDOWS\system32\drivers\winsys32.sys with a start type of 1 which according to Microsoft "represents a driver to be loaded at kernel initialization", or what appears to be the persistence mechanism. Now we need to learn more about this apparent driver, and maybe even grab a copy of it for ourselves. 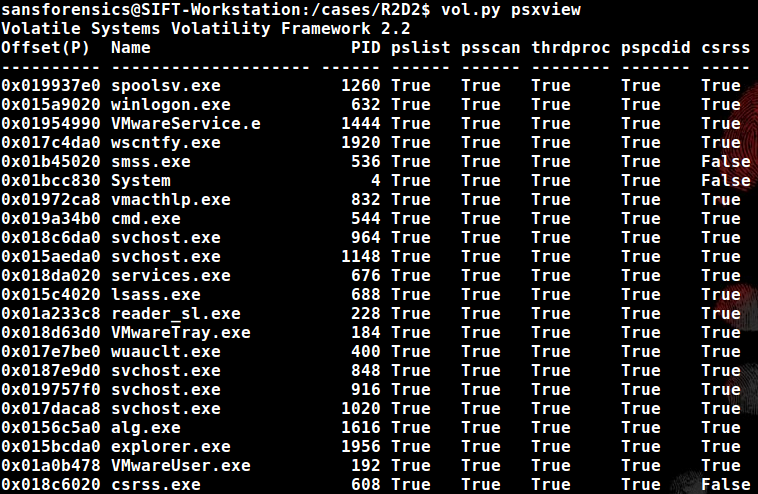 Using Volatility's svcscan we can gather more information about the "malware" service. The results show that the driver associated with this service is recognized as \driver\malware. We can now work toward grabbing a copy of the running driver. We must execute a driverscan to access the starting memory address of the driver. Once the address is obtained (0xf9eb4000) we can use moddump to dump the driver at the address specified using the -b parameter. 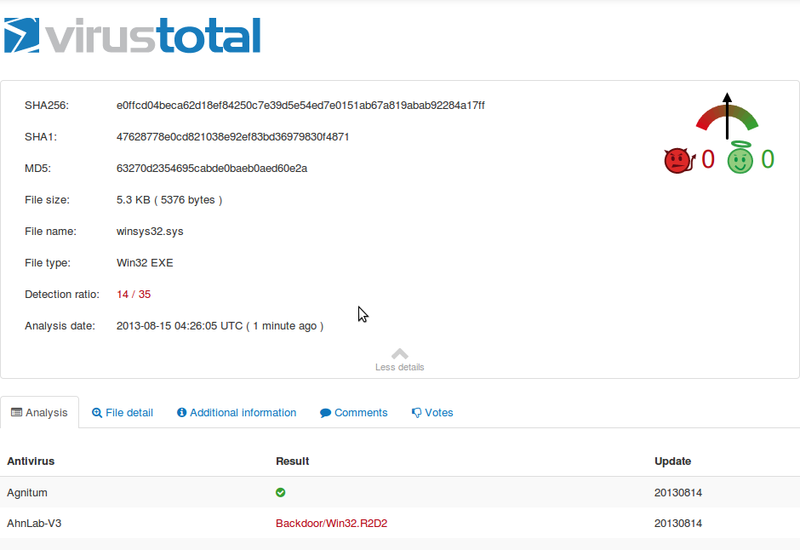 We now have a copy of the suspected malicious driver (winsys32.sys), which we can pass to Virus Total (if we think it has been seen before) or our reverse engineers. I submitted the driver to Virus Total, and it was flagged by 14/35 anti-virus programs as the R2D2 backdoor. We can perform rudimentary analysis of the driver using the strings utility. 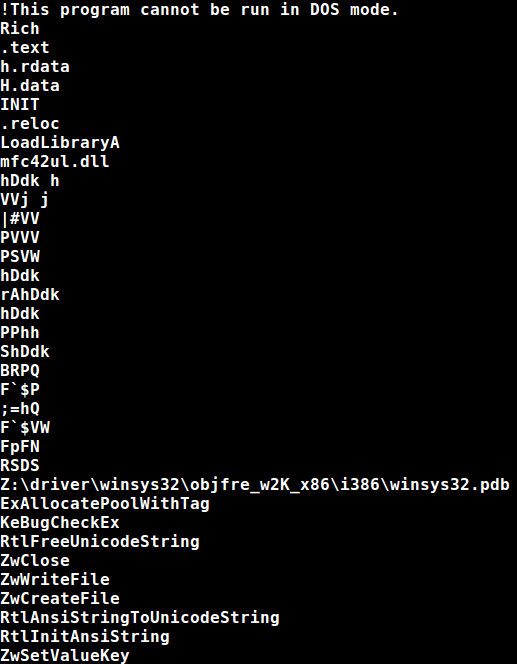 Below is an example of view the ascii strings contained within the malicious file. Earlier we found a suspicious network connection coming from explorer.exe. We know explorer.exe to be a legitimate process, so we may want to look for dll injection as a possible avenue of infection. We can list explorer.exe's loaded modules using the dlllist plugin. One module (mfc42ul.dll) seems to stand out because its virtual address is so different than other modules (0x10000000 vs 0x70000000). I am unsure if this is a valid indicator of dll injection or just a coincidence, but I submitted the module to Virus Total, and the dll was flagged as being associated with the same R2D2 backdoor. NOTE: In the ascii strings output of the malicious driver (winsys32.sys) we find references to the malicious module (mfc42ul.dll). 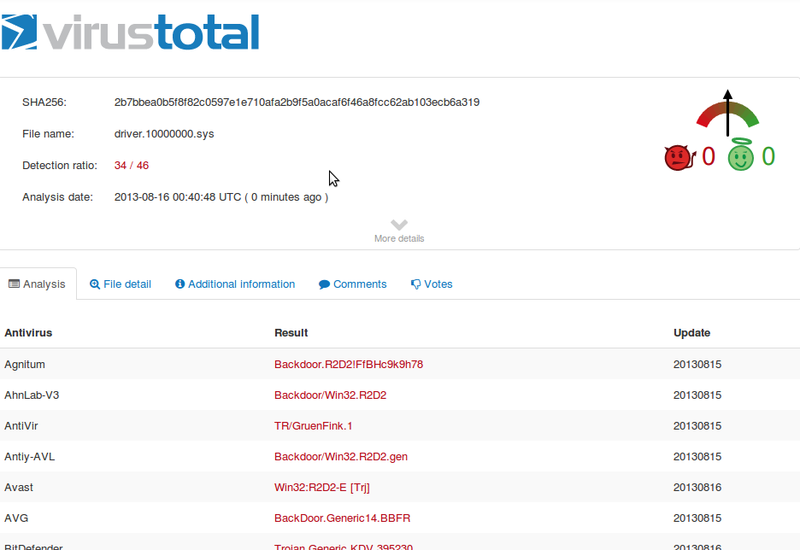 We perform some quick triage of the dll and notice some strings that indicate HTTP functionality, and we also see a string "C3P0-r2d2-POE" which appears to be the string that got this malware its name. 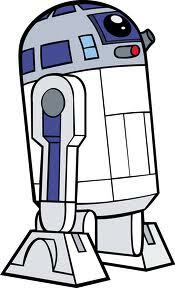 That wraps up my analysis of the R2D2 backdoor. Upon completion of my analysis, I stumbled upon evild3ad's blog post documenting his analysis of the same sample. Please check it out! If anyone has additional details I missed, or has any feedback to improve my methodology it would be greatly appreciated. Thanks for the analysis and the links. I like the way you explain things. Thank you very much.....The way you explain things is very easy to understand even for a novice.